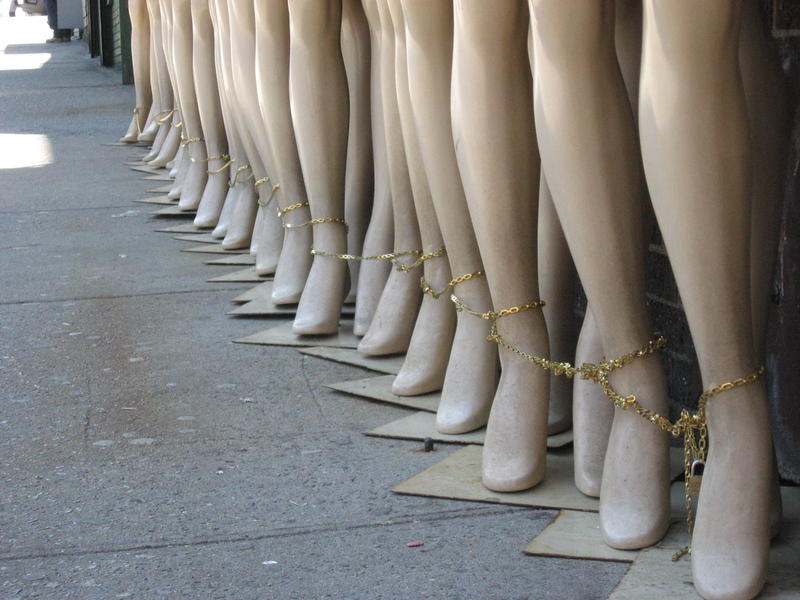 Photographs of the Bronx without comments, captions or backstory from me. Only the location, (visible when you hover the cursor over the image). All photos by Bronx Bohemian. I have never prayed for a president. It has never occurred to me. Let Love Rule for Obama has launched an initiative: a commitment to doing a daily 8 second prayer for President Obama. 8 seconds every day for the next 8 years. I do believe in collective prayer. I love the uneven saturation of the ink on the paper. I love the thickness of the paper. 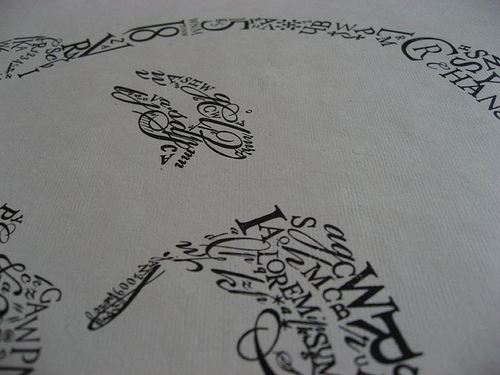 I love the visible grain from wood type on the paper . Then I came upon this Obama poster on Blogorrhea Junior. 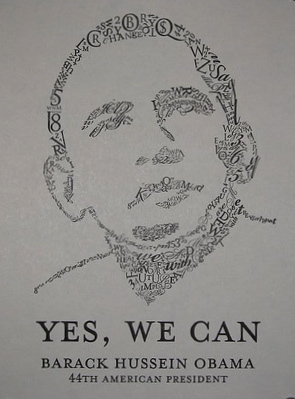 The illustration of President Obama is comprised of letters and numbers and characters. Nothing is completely random about their placement. The artist, Kishore Nallan, embedded important dates and figures in the design relevant to the Obama presidency. (“365” for the number of electoral votes he won, “Jan 20” the date of the inauguration and “53%” for the percentage of total votes won). The poster was created on one of the few platen presses in Chennai, India after 40 hours of laying the type by hand. This year also marks the 100th anniversary of the Vandercook Press. 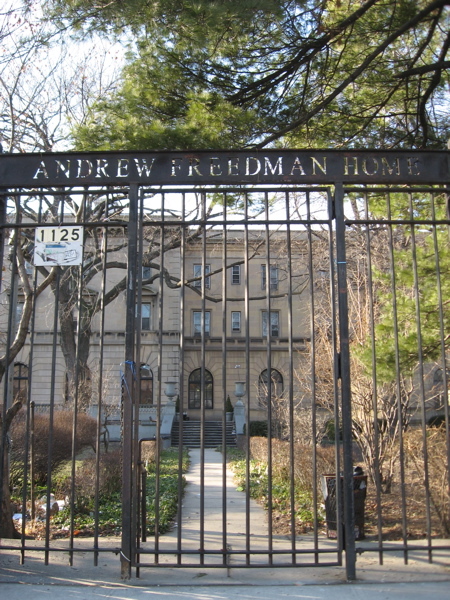 Andrew Freedman Home front gate entrance. I have been curious about the Andrew Freedman Home since I first saw it last summer. 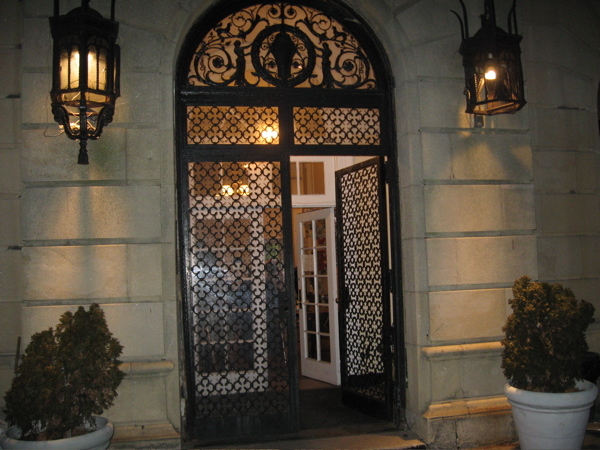 Its quirky history as a “poorhouse for old rich folk” and its elegant architecture drew me in. It was open and functioning for almost 59 years. 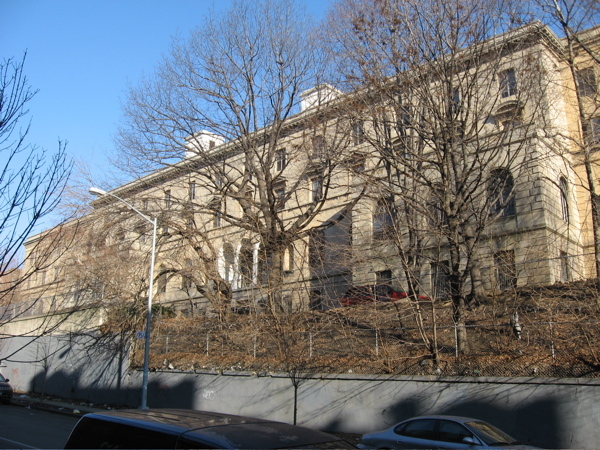 How was it viewed by its surrounding neighbors on the Grand Concourse–over time and through the years–as the complexion of the neighborhood changed? With resigned acceptance? With envy? With disdain? Or maybe those were the shared sentiments inside or outside the Home’s walls. I think too of its meaning given our current economic mash up — with the proposed cap on bank execs salaries. Just last week, The NY Times, ran an article about how difficult it’s becoming to eke out a living in Manhattan on a measly $500,000 a year. Brokeness is relative. One person’s five hundred grand could mean hitting the jackpot, for another it’s akin to the horror of using food stamps. 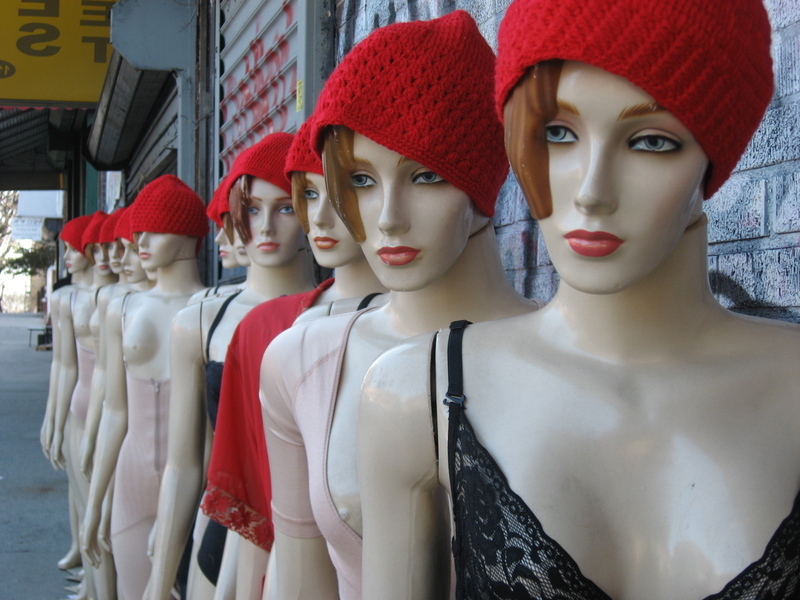 A man I know, garment district veteran and instructor at the Fashion Institute of Technology, and his school teacher wife, told me his retirement savings plunged six figures last fall. Such stories are being told by the second these days. Does a modern version of the Andrew Freedman Home exist? In the meantime, here’s what I found out about it. Before Andrew Freedman died from a stroke of apoplexy in 1915, he had a fresh new philanthropic idea for his millions and put it in writing. The whole thing was sealed shut and placed in the vaults of the Hanover Trust Company. He wanted half of his millions to go to his mother, sister and brother. And with the other half, he wanted to build a home. A home for people like him. People who knew fine wines and went to the theatre, but for whom, by some unfortunate twist of fate found their finances on a downward spiral landing them in the poorhouse to live out their old age. He would offer them a haven to live out their twilight years in the utmost of cultured and refined surroundings with amenities to match — free of any charge — rescuing them from the disgrace and shame and the inconvenience of rubbing shoulders with the “unwashed masses”. He left an estate worth $7 million and 29 pairs of shoes. Cornelius Vanderbilt was one of his pallbearers. Andrew Freedman was a self made millionaire. Born in Manhattan in 1860. He attended elementary school on 13th Street and was a CUNY grad. 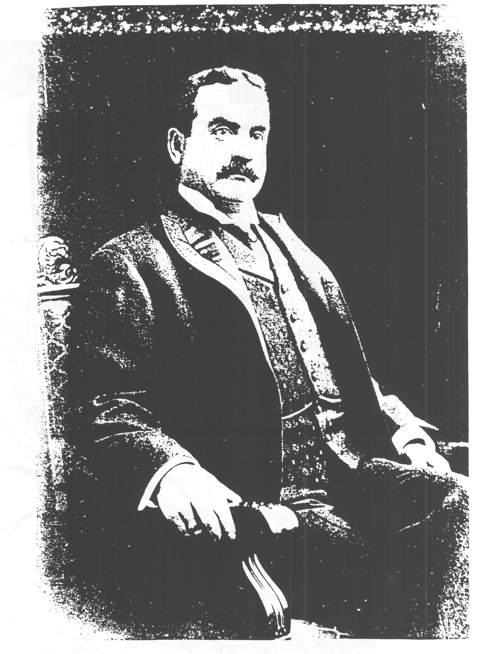 He invested in real estate and Shubert theatres. He was a bondsman for city contractors and a Tammanyite — at one time the head of that org’s finance committee. His closest and life long friends were city politicians and leaders in the Tammany Hall Democratic machine. He was fiercely loyal to them. At the close of a Kansas City convention, he barred a certain local reporter from interviewing Tammany big boss Richard Croker. Those that wrote unfavorably about Freedman in the papers did not go unchecked. A few hours later, he would be arrested for punching the man. (Freedman left his set of $500 pearl shirt buttons to his good friend Croker when he died. Croker would live out his golden years at his “baronial estate” and stud farm, Glencairn, back home in Ireland). But Freedman never ran for office himself. The original IRT subway line was constructed because he financed it. Or rather he and a few other wealthy men, two he’d introduced, formed the Interborough Rapid Transit Corporation. At 34, he became owner of the New York Giants baseball club. Under his eight year tenure, the club had 23 managers. Only reporters writing glittering stories were allowed to see the games. He docked the pay of his star pitcher, Amos Rusie, for not trying hard enough. Rusie responded by sitting on the bench for one full season. Tower Hill in Red Bank, New Jersey was Freedman’s place in the country. His ice yacht, “Haze”, took the 1st class prize in a North Shrewsbury pennant race there. He drove Miss Elsie Rothschild to Tower Hill, in his “high powered machine,” a Mercedes, and proposed to her. She answered “yes” by the time they were back in New York. But their wedding never took place. Apart from his spot in Red Bank, he owned parcels of land in New Hampshire and in the Bronx (at 149th Street and Southern Boulevard), well before the area was settled. The Andrew Freedman Home grand opening was delayed. Then the posh applicants were simply, not posh enough. Membership was open to all regardless of race, faith and gender. Husband and wife were allowed to come as a couple. A major coup — as many benevolent institutions of the time separated them. Potential members didn’t have to be American. They didn’t have to be from New York. But they had to be at least sixty but not past eighty. The Home finally opened in 1924 with 17 members. And an interior filled with the stuff Ralph Lauren ads are made of. Overstuffed sofas and thick pile carpets. Arched windows and high ceilings. A log fireplace in the main lounge. A library with bookshelves against oak paneled walls. Red and black dining room chairs in the Chinoiserie style. Oil paintings of at least one of the Freedmans in every room. The wait staff had been plucked from Cunard liners and from the finest yacht clubs and private clubs. So too had the chef and the pastry chef. The staff of fifty, including three nurses, an in-house infirmary, elevator operators and a dietitian, gave them more care and attention than they could have anywhere. For all of this the members would pay nothing. It was a deal and they knew it. Some tried to buy their way in. They could show up for dinner in a suit jacket and tie or an evening gown. Nasty behavior toward the staff was strictly forbidden. At its peak, the Home was home to 130 members. For the most part they were not the filthy rich, but “professionals” –doctors, lawyers, a nurse, a teacher, businessmen, engineers, journalists, as well as some creative types — actors and an opera singer– and a former Russian czarist general. French born and Belgian bred, Jules Buoy, designer of the Home’s interior decor, was a member there. They were a social lot–with parties, weekly dancing and monthly movie screenings of new releases from Columbia pictures on the calendar. Even a Christmas party to shower gifts on orphaned children. They had to maintain a monied appearance. Single members were not allowed to marry an “outside” lady or gentleman, so as not to attract gold diggers. They were in charge of the expenses for their cigars, bridge lessons, clothing and vacation travel. And they had to have enough to pay for their own funerals. Even with all this splendor, some members still suffered. One 84 year old widow, a former Brooklyn society figure and animal rights activist (against cruelty to horses), was eager to meet her death and inhaled chloroform fumes. By the mid 1980’s, the Andrew Freedman Foundation money had run out and the the home was closed. 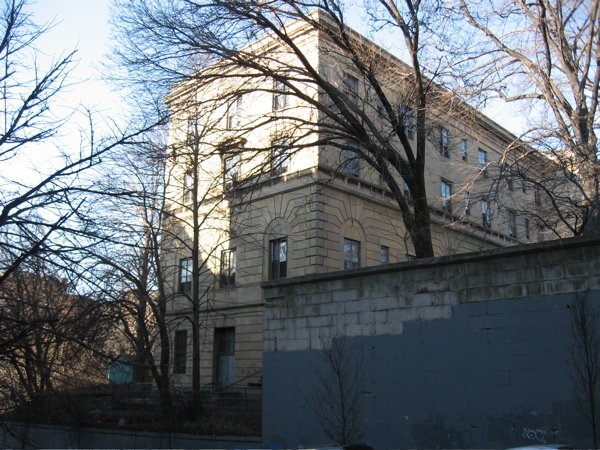 And in 1983, It was bought and is still owned by the Mid Bronx Senior Citizens Council. The millionaire requirement is long gone and the current residents represent a much broader range of situations. 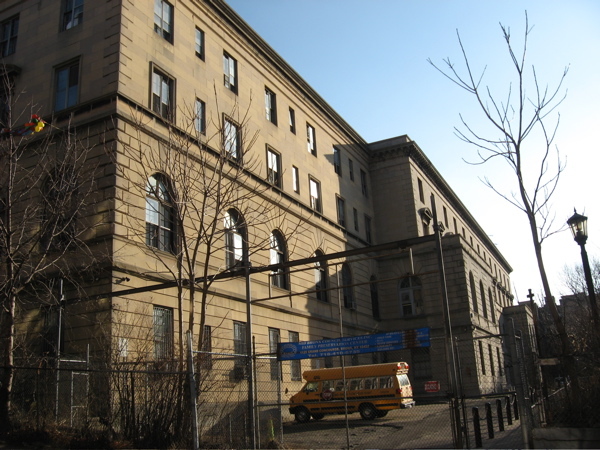 The Mid Bronx Council family support programs are housed on the main floor of the building with the residents occupying rooms on the upper floors. 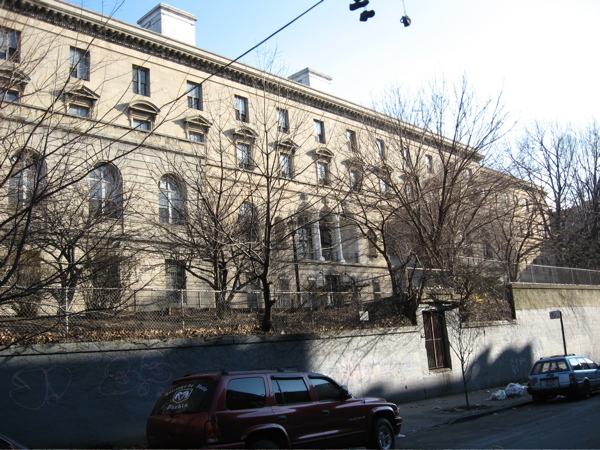 If the flavor of architecture on the Grand Concourse is Art Deco and Art Moderne, the Andrew Freedman Home is striking because it is not. It is not curvy with rounded corners. It does not have a zig zag facade, but a clean and simple one. Its cool elegance is rectangular and symmetrical. The Home occupies an entire square block. The Grand Concourse on the front. McClellan and East 166th Streets on the north and south ends respectively. And Walton Street at the rear. The land underneath the building slopes downward from the front to back. And a stone wall support runs along the south end and the rear. One of the most striking features of the building is the great and deep lawn that separate the front from the street. No other building sits like this along the Grand Concourse. On the Concourse side the building is three stories high and on the rear side it is four stories high. The building is of yellowy limestone. 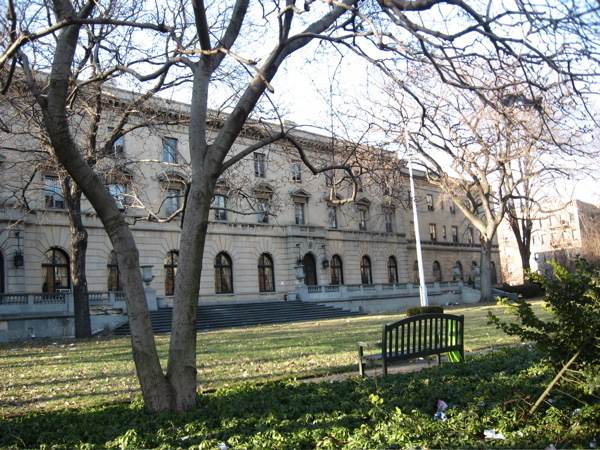 The original building, designed by architects Joseph Henry Freedlander and Harry Allan Jacobs went up in 1924. Four years later, wings were added expanding the Home to its current size and layout. Architect David Levy designed them. Construction was completed in 1931. 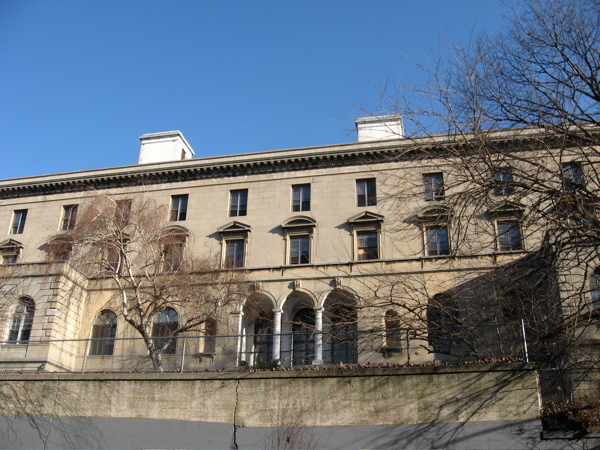 The architects, Freedlander and Jacobs, were native New Yorkers and attended the Ecole des Beaux Arts in Paris. They knew European architecture and had visited and studied many classic monuments abroad and brought those details to the Andrew Freedman project. 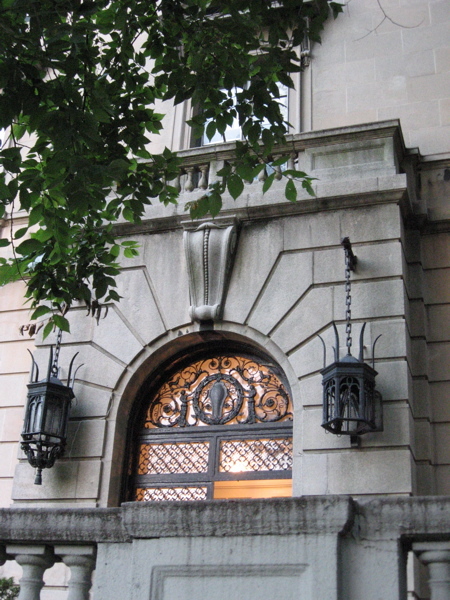 The building has many features characteristic of Italian Renaissance design. And the architects were surely influenced by many structures with this style. 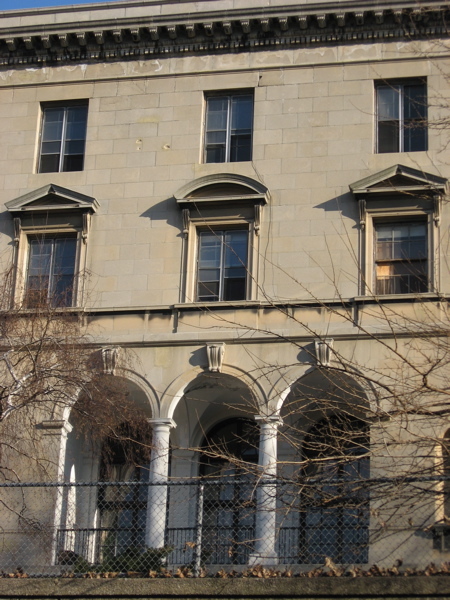 Overall, the Freedman Home recalls the Palazzo della Cancelleria in Rome. Windows of the Home have an interesting detail — the pediments over each alternate from triangular to arch. This detail is seen in the Palazzo Farnese in Rome. And the pattern of the limestone arching over other windows resemble the same detail on the Palazzo Gondi also in Rome. 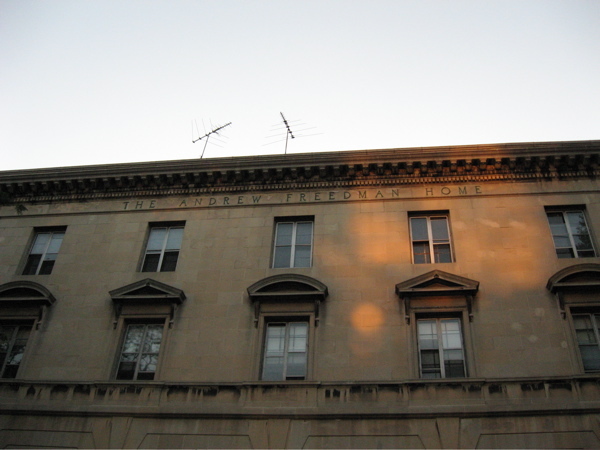 The front facade bears the simple inscription “The Andrew Freedman Home”. And the back facade is impressive with triple arches over a recessed terrace in the middle. Wintertime is great to see these details as all the trees limbs are bare. 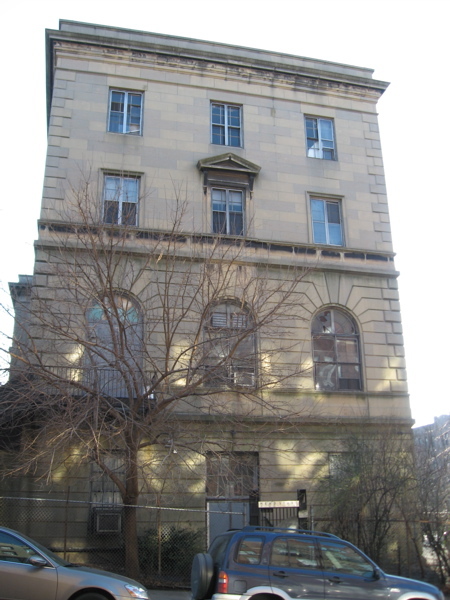 The Andrew Freedman Home acquired landmark designation in 1984. What do Graffiti Artists do When They Grow Up? 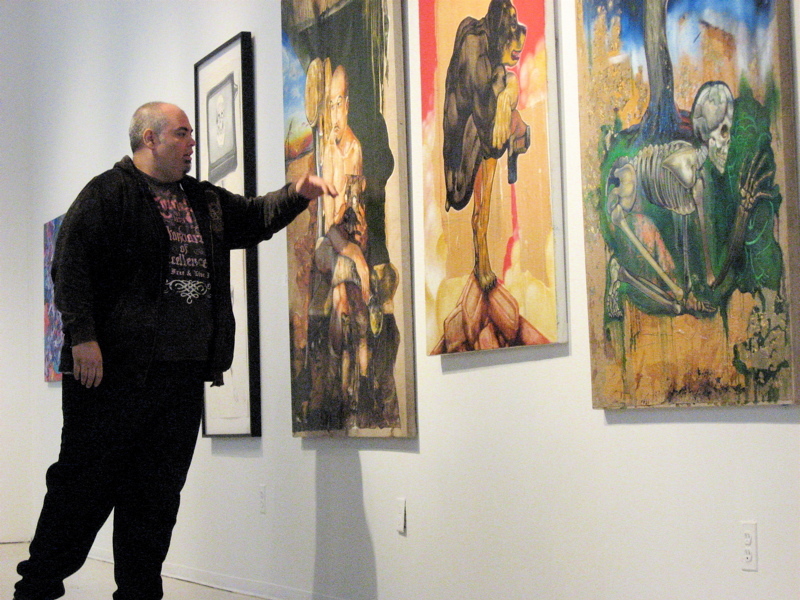 Ezo with his work at the Longwood Art Gallery in the Bronx. I love to hear artists talk about their work. Yes, the work should stand on its own. Commentary from the artist should not be necessary. That’s one school. But I saw the exhibit Graffiti Spirit of an Age @ 40 x 10 * without it. And I was really confused. I got that this was a kind of “where are they now” for these former graffiti writers from the mid-80s. 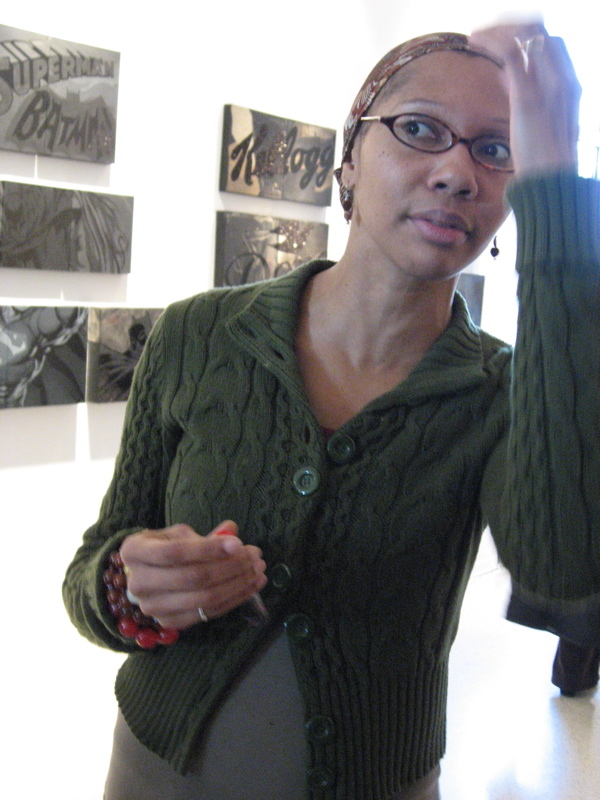 But the work–metal sculpture, collage, prints, paintings–all together didn’t have a binding theme. The work I liked the least didn’t resemble any of the other work in that it looked most like graffiti. And a couple of canvasses looked unfinished. So we went back for the Artists Talk. Three of the ten showed. (“Graf artists are shy and don’t like to come out,” Ezo explained.) They talked honestly and openly. They have a love/hate view of their graffiti period–they recognize it as a vital part of their past, but one they’re not often eager to ‘fess up to. The afternoon turned into a bit of a love fest. Mainly teenage guys in attendance, a few taking photos. One guy was filming with his point & shoot camera, ran out of space and then started recording with his iPhone. (He’d hacked it. I asked.) 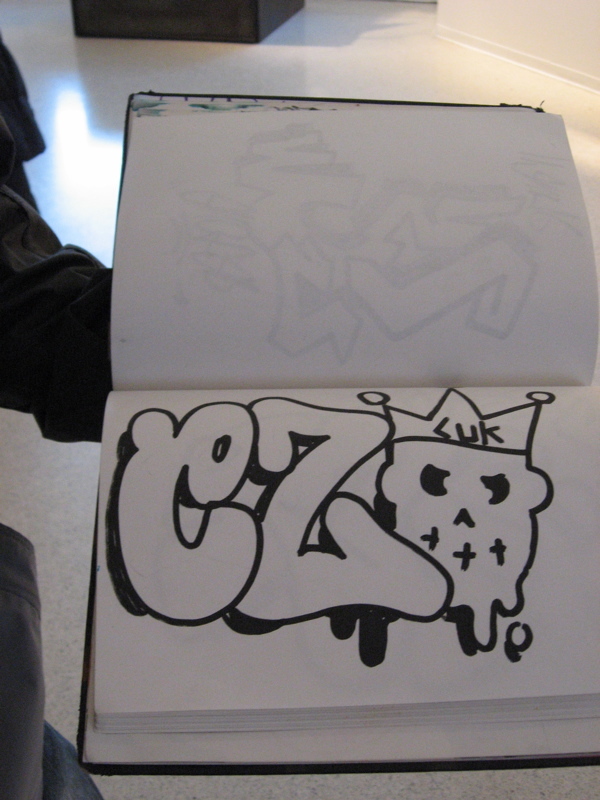 Others came with their black sketchbooks asking the old school writers for their tags. Ezo today = painter…uses pre-columbian imagery and saints in his paintings, influenced by war and the US involvement in the Middle East, working on a series of canvasses on the Seven Deadly Sins. 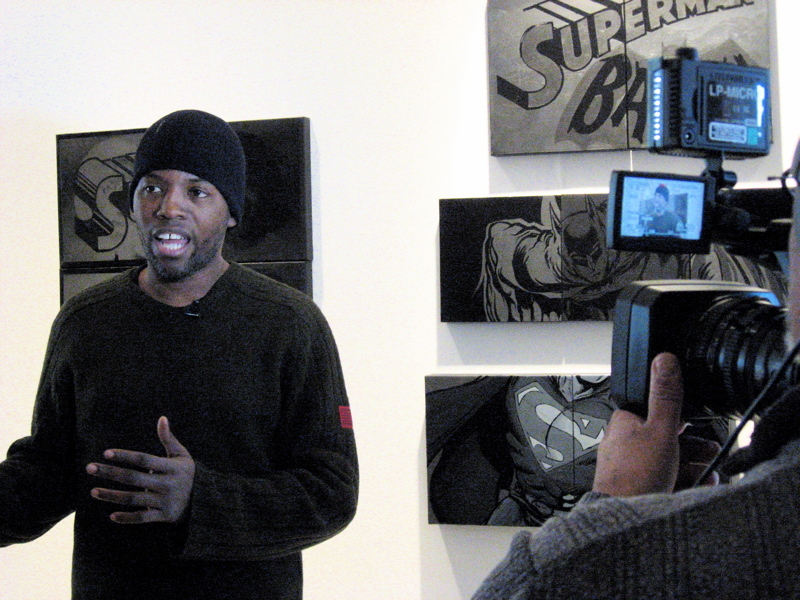 Cey speaking on his work at Longwood Art Gallery. Cey today = graphic artist and art director…influenced by pop art and superheroes, Warhol and Lichtenstein…learned screenprinting from one of Warhol’s Factory printers…uses Diamond Dust (tiny fragments of ground diamonds) on his work. 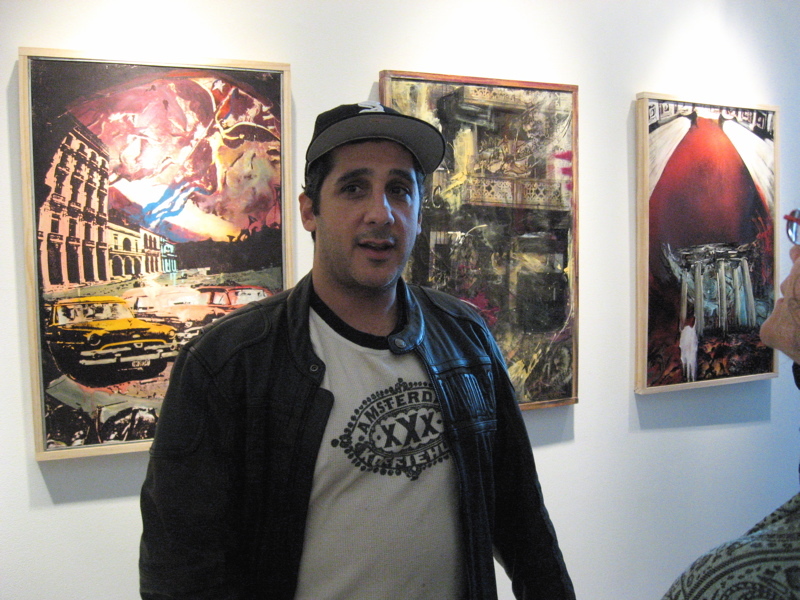 Klass in front of his work at the Longwood Art Gallery. Juanita Lanzó, Program Coordinator, at Longwood Art Gallery. 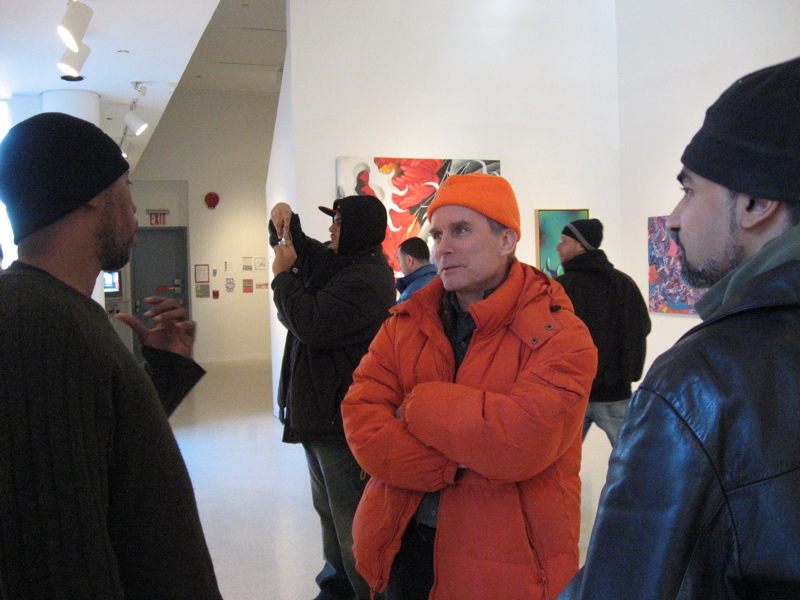 Wildstyle filmmaker, Charlie Ahearn, in orange parka listening in. 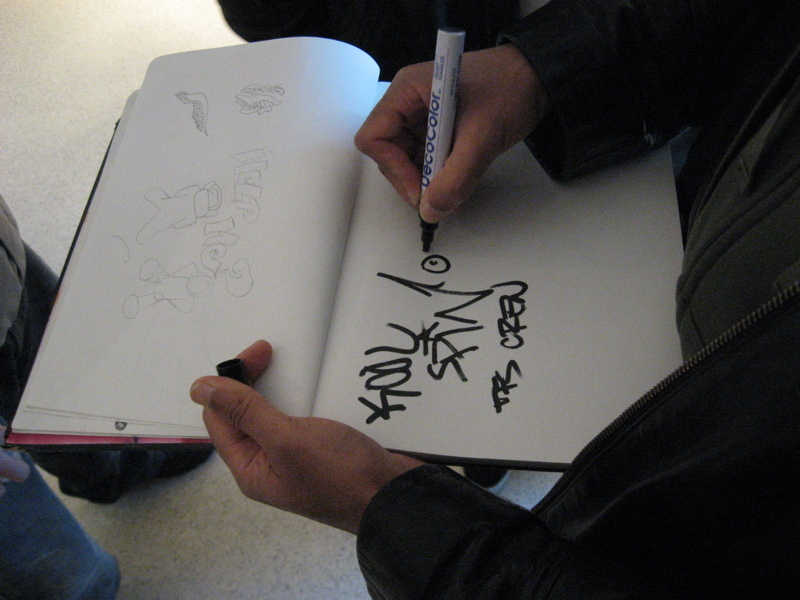 Kool Spin tagging a sketchbook.